Welcome to my last post of 2018! I took a little bit of a break from the blogging world for the past few weeks for a few reasons. One was my own sanity. I have been extremely busy the past four months, and that will not stop when January starts again. As for the end of our 2018, we hosted a bit of a party, and I made two desserts. I made my Lemon Squares, and these. So good! Next month, we are finishing up the first semester of this school year, my grade 12’s are writing diploma exams, I go to Edmonton to mark exams, and then we get right into the second semester. The life of a teacher is never boring! I hope everyone had a great Christmas holidays! Ours was busy. We spent Christmas Eve and Christmas Day driving around Southern Alberta, and are in the throes of planning a New Year’s Party that is about to get into full swing in a few minutes. For Christmas, my mom gave me a cookbook full of a bunch of desserts. I spent a few hours looking through the cookbook, and this was one of the recipes that stuck out to me. It looked simple, and I had everything in my pantry. The perfect dessert. This recipe came from the Company’s Coming 150 Delicious Squares book in the Company’s Coming Sweet Treats 2-in-1 Cookbook. It was extremely simple to make, the perfect kind of dessert. Line a square 9×9 pan with parchment paper or aluminum foil. Preheat the oven to 325°F. In a small bowl, combine the flour, butter, and sugar for the crust layer until the mixture resembles fine crumbs. Press into the prepared pan and bake in the preheated oven for 25 minutes, or until golden. Cool on a wire rack completely before filling with the marshmallow layer. To make the marshmallow layer, in a small saucepan combine the cold water and gelatin, and let sit for 1 minute. Add the sugar and salt, and heat the saucepan on low until the sugar is dissolved. Remove from the heat. Whisk in the icing sugar, and transfer the mixture to a large mixing bowl. Chill the large bowl, uncovered, for about 20 minutes, stirring every 5 minutes until very thick. Mine took about 25 minutes. Remove from the refrigerator and beat in a mixer with the whisk attachment until foamy. Add in the almond extract, vanilla, and the food colouring, and beat on high for about 10 minutes, until mixture is thick and soft peaks form. Spread evenly over the cooled bottom layer. Chill for at least 6 hours or overnight, and cut into squares and serve. Summer time means summer flavours, and what’s more reminiscent of summer than a s’more? I’ve experimented with a few s’more desserts here and there on the blog, and now, it’s high time for another one! These bars have the best of both worlds. Everything you need for a s’more: marshmallow, chocolate, and graham crackers, combined with cookie dough. Delish! The beautiful thing is that your graham crackers are your base, so this is actually quite a sturdy bar. The cookie dough, laden with tons of mini marshmallows and chocolate chips, is put on top of the graham crackers, all baked together, and then EVEN MORE s’more fixings are put on halfway through baking to create a chocolatey, gooey, amazing dessert. I found the original recipe here, and only changed the chocolate chips required. I didn’t have milk chocolate chips, so I just used all semi-sweet. You don’t need to, though. If you want a mix of milk and semi-sweet chocolate, just go half and half. I can’t complain though. These bars are pretty simple to whip together. Paul loved these, I loved these, and I might go get one to snack on as I’m writing this. These cookie bars are so good! Make them now. 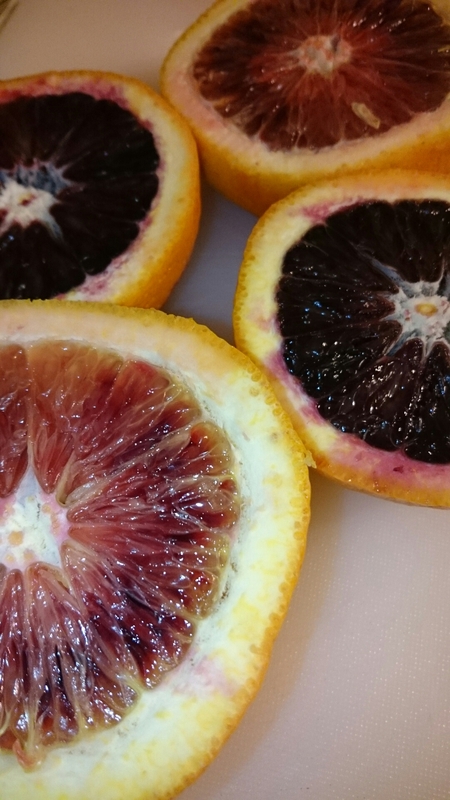 It’s going to be a short post, because GO MAKE THESE! If you are a lover of all things s’mores, you will love these! Preheat oven to 375° F. Line a large rimmed baking pan (13 x 18) with parchment paper. Line the bottom of the pan with the square graham crackers. Try to get an even layer with no gaps. In the bowl of a mixer fitted with the stand attachment, cream together the butter and sugars until light and fluffy. Add the vanilla, then the eggs, mixing after each addition. In a medium-sized bowl, whisk together the flour, baking soda and salt. Slowly beat in the flour mix until just incorporated. Fold in the chocolate chips, and 1 cup of mini marshmallows. Using an ice cream scoop or a spoon, drop small balls of cookie dough evenly over the graham cracker base. Once all your dough is on the graham crackers, use a spoon or your hands sprayed with cooking spray, to lightly pat down the dough evenly over the graham crackers, trying to get as even a layer as possible. Remove from the oven, then sprinkle the remaining marshmallows over the top of the cookie bars, as well as the reserved crushed graham crackers. Break your chocolate bars into squares and sprinkle over the top of the bars as well. If your marshmallows did not get as brown as you would have liked, turn on the broiler and broil the bars for 1-2 minutes, keeping a close eye on them so they don’t burn, just turn a beautiful golden brown. Remove from oven and cool completely in pan on a wire rack. Cut into bars or squares, and serve. When I think of pavlova, I think of my dear friend Rita. She was the first person who introduced me to the deliciousness of pavlova, and did so in such a beautiful way that it will always be cemented in my memory. A strawberry-kiwi pavlova with whipped cream. Amazing. With the end of the school year comes goodbyes. These goodbyes are always hard, and one of these hard goodbyes was to my fellow staff at my school. Teaching contracts can be finicky things if you don’t have a permanent or continuing contract, which I didn’t this year. Hence, we had to say goodbye. For our year-end staff get-together, we decided to have a potluck. Considering my luck with cheesecake (you might remember my Salted Caramel Pecan Cheesecake), both myself and my fellow staff members were all for me making dessert, and I wanted it to be something special. Paul was the genius that suggested pavlova, and I had everything in the fridge to make it, including cream to make whipped cream to top it. The only thing I didn’t have was the fruit. 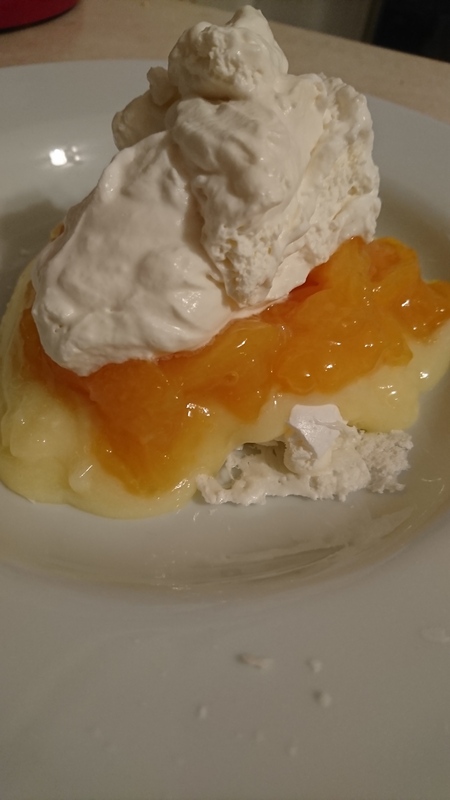 I bought strawberries and peaches, and made simple fruit toppings to go with the pavlova, the lemon curd, and the whipped cream. The original recipe I found here. I have found that pavlova is not particularly difficult to make, but is time-consuming. Still, the results were worth it. I will let you know, pavlovas are traditionally Australian, and are meant to be crisp on the outside, and slightly gooey and marshmallow-esque on the inside. These ended up practically perfect. I made a few changes to the recipe, none very special or important. Instead of making one large pavlova, I made a dozen small, individual-sized servings. This made it much easier to serve. Either way, I was very pleased with the results, so were my staff members, and so was Paul. It was a win-win-win situation. This is the perfect summer dessert; light, airy, fruity, sweet, tart. It’s got a bit of everything you need. To make the pavlova, preheat the oven to 395°F. Line a baking tray with parchment paper. If making one pavlova, trace a cheesecake ring on the parchment paper and flip so the traced circle is next to the baking tray. If making 12 portions, line two trays with parchment paper. In a stand mixer fitted with the whisk attachment, beat egg whites and cream of tartar on high until soft peaks form. Add sugar, one tablespoon at a time, not stopping the mixer until mixture is thick and glossy, and the sugar is completely incorporated. Add the cornstarch with the last tablespoon of sugar. Whip until sugar is completely dissolved. Once the sugar is dissolved, use a spatula to fold in the vanilla and vinegar. Spoon the meringue into the ring on the prepared pan, or the twelve portions on the two pans. Make the centers slightly depressed and the edges slightly higher, so the meringue forms a shallow bowl shape. Place the meringue into the oven, and IMMEDIATELY lower the oven to 210°F. Bake for 1½ – 2 hours, until the outside of the meringue feels dry and crisp. Turn off the oven, and leave the pavlova in the oven to cool completely. For the lemon curd, in a large bowl over a pot of simmering water (or a double boiler), combine all curd ingredients, and whisk until combined. Whisking constantly, the mixture will thicken over the course of 15-20 minutes. When the mixture coats the back of a spoon, and does not run easily off, it is done. Transfer to a bowl, and cover with plastic wrap until cool. To make the fruit topping, combine all ingredients in a small saucepan until thickened and smooth. 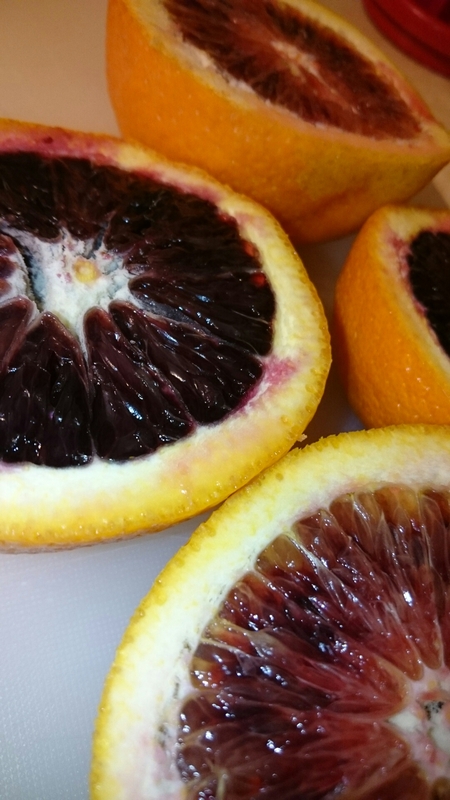 Fruit will cook down until tender and soft. Transfer to a bowl and cool. To make the whipped cream, combine all ingredients in a mixer fitted with a whisk attachment, and whip until thick and smooth. To assemble, slice pavlova, or take a pavlova round and place on the serving dish. 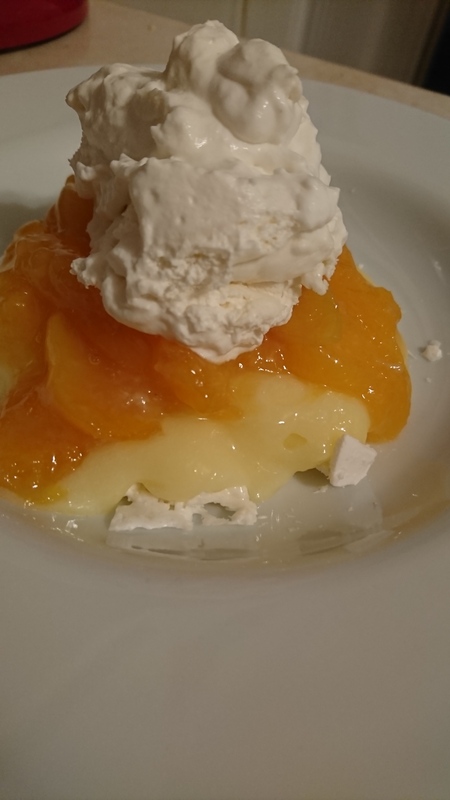 Top with lemon curd, the fruit topping, and whipped cream, and enjoy! Who doesn’t love marshmallows?! And with Root Beer? Either I’m crazy, or a genius, or both. Any time I eat a marshmallow nowadays, I think about all kinds of new flavours to try. 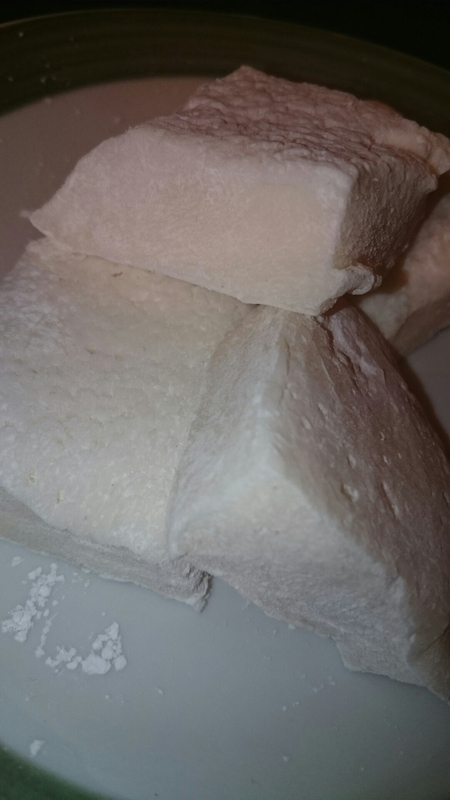 Homemade marshmallows are just so much BETTER than store bought. They really are. And you can incorporate so many flavours – if it comes in an extract bottle, chances are you can make a marshmallow with it. I have a bottle of Root Beer Concentrate from Watkins and courtesy of my mom, and Paul loves it. We’ve put it in magic shell, cupcakes, and now I got the crazy idea to try it in marshmallows! 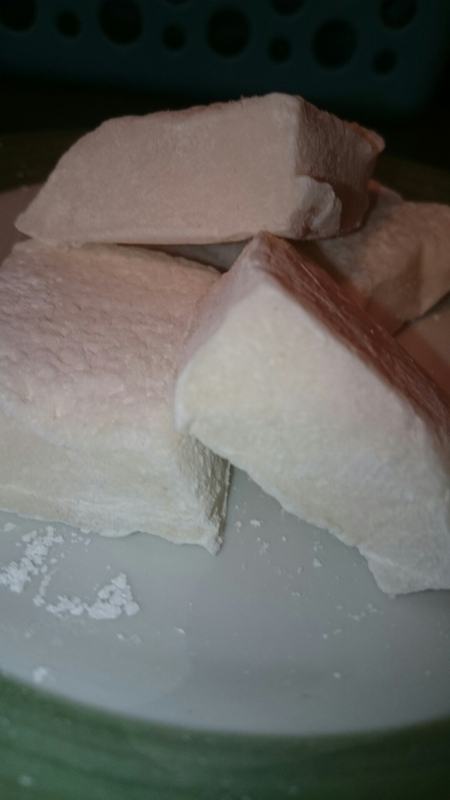 The best thing about homemade marshmallows is that they are so EASY. It never takes me longer than half an hour to make, and it takes more time for marshmallows to set up than it does to make them! Sure, you do need a candy thermometer, and a mixer is helpful here, but they are so worth the extra effort of making homemade marshmallows. These homemade marshmallows will up your s’more game – guaranteed! Line an 8 x 8 or 9 x 9 inch square pan with parchment paper. In a small bowl, mix the icing sugar and corn starch. Sprinkle some of the icing sugar mixture into the pan, trying to cover the bottom and sides of the pan. Set aside. In the bowl of a mixer with the whisk attachment, place ½ c. of the cold water, and sprinkle the gelatin over to soften. In a medium saucepan, whisk together the rest of the water, sugar, corn syrup, and salt. Place a candy thermometer in/on the pan, and heat. Cook until mixture reaches 240°F. When it does, immediately remove it from the heat, turn on the mixture to it’s lowest setting, and drizzle the sugar syrup down the side of the bowl. Once all of the sugar syrup is incorporated, turn the mixer to high and whip until mixture becomes thick and lukewarm. The colour should also change from transparent to white. Once the mixture is thick and has almost the consistency of melted marshmallow, add in the Root Beer Concentrate. Mix the extract in well, then pour the marshmallow mixture into the lined pan. 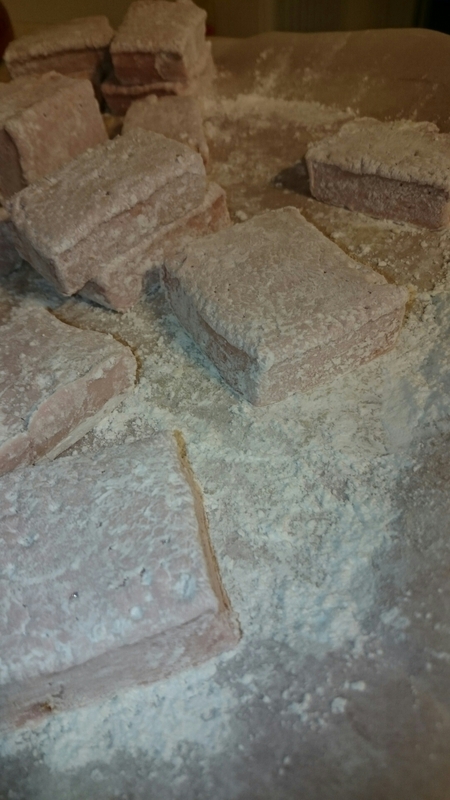 Sprinkle more of the icing sugar mixture over the marshmallows, then leave to set 4 hours or overnight. When ready to cut, lift the set marshmallows out of the pan onto a cutting board. 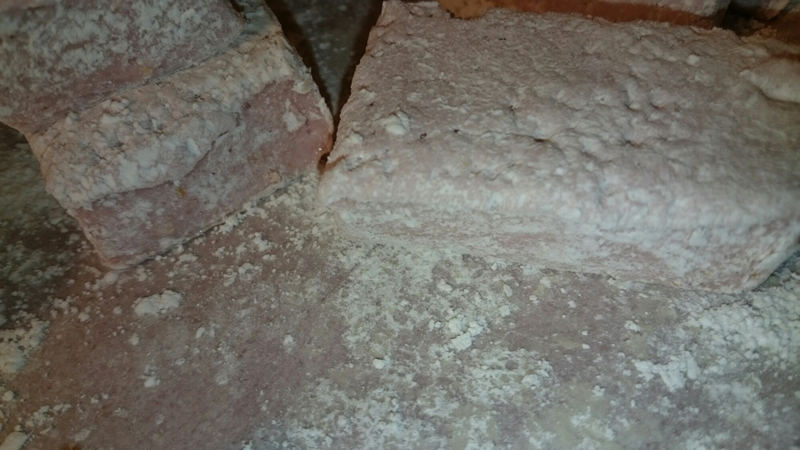 Use a pizza roller dipped in the icing sugar mixture, tossing the cut marshmallows in more of the icing sugar mixture so they don’t stick together. Store in an airtight container or plastic bag.